The M. Zuiko Digital ED 12-100mm f/4.0 IS PRO lens is in a class by itself. It’s the only professional high magnification zoom to cover a 35mm equivalent 24-200mm focal range all on its own. This Micro Four Thirds lens features premium construction and superior glass to provide spectacular optical performance. Capture images with razor sharpness thanks to 5-Axis Sync IS, the world’s most powerful image stabilization system. Every inch of this lens is PRO: weatherproof construction, fast autofocusing and effortless control. Its broad focal length lets you shoot portraits, wide-angle, landscapes, and macro. One lens. Unprecedented versatility. Let’s start with the obvious: the 12-100mm f/4.0 IS PRO (24-200mm 35mm equivalent) is pretty small. At approximately 21 ounces, it’s lightweight to carry all day and compact to easily fit in a small bag. It captures amazing images with its constant f/4.0 aperture, edge-to-edge sharpness, and minimal distortion at all focal lengths. By comparison, it typically takes two professional lenses to cover the broad focal range of the 12-100mm f/4.0 IS PRO. This single lens makes for a lighter, more streamlined system. Smaller is better for travel, nature photography, and everyday convenience. 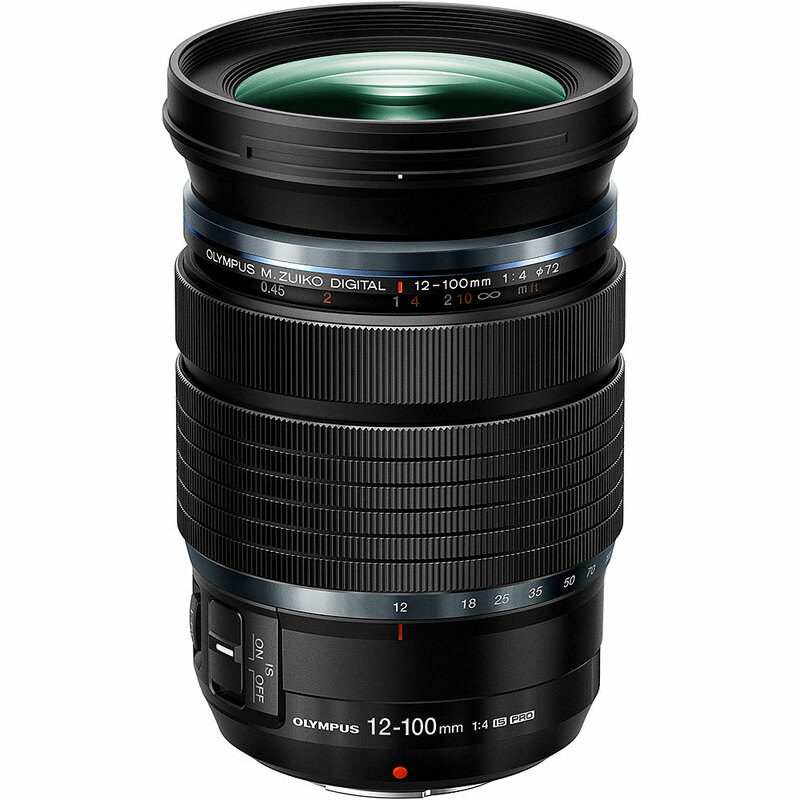 The 12-100mm f/4.0 IS PRO lens boasts a lavish collection of 17 lens elements in 11 groups. This remarkable combination ensures superior resolution, sharpness, and suppressed aberration. Cutting-edge lens materials and manufacturing processes help to make these special elements smaller, so this professional lens boasts a compact form without sacrificing image quality. Use the 12-100mm f/4.0 IS PRO in all shooting situations. Z Coating Nano, our most advanced lens coating, is nanoparticle-based and practically eliminates ghosting and flares caused by in-frame light. Plus, the near-silent MSC focusing mechanism complements the precise, high-speed AF for crisp stills and smooth video. The 12-100mm f/4.0 IS PRO features effective in-lens image stabilization. On its own, this lens provides up to 5 shutter speed steps of compensation. Even better, pair the lens with a compatible OM-D or PEN camera body to get a tandem of image stabilization systems – one in the body and one in the lens. This creates 5-Axis Sync IS, the world’s most powerful image stabilization system. It provides up to 6.5 shutter speed steps of compensation at 200mm (35mm equivalent), compensating for all types of camera motion. Leave your tripod at home and shoot stunningly sharp handheld telephoto images and video. We designed the 12-100mm f/4.0 PRO so that you can shoot near and far, even at exceedingly close range. This lens has a minimum working distance of 1.5 cm at the widest focal length, or just over half an inch from the front of the lens, for effortless macro shooting. The maximum magnification of .60x (35mm equivalent) lets you capture small details on small objects. Capture exquisitely textured shots of flowers, insects, jewelry or any other object where you need to get close, no additional lens required. If you can handle shooting in adverse conditions, so can the 12-100mm f/4.0 IS PRO lens. Its pro-quality metal construction is hermetically sealed to keep out moisture and dust for splashproof, dustproof, and freezeproof performance. Pair this lens with a weatherproof OM-D body so that you can take advantage of every photo opportunity without ever worrying about your equipment. The 12-100mm f/4.0 IS PRO makes it easy to get the shots you need. The customizable Lens Function button lets you easily control your choice of camera functions right from the lens barrel. Programmable functions include Focus Peaking, AF Stop, and Magnify. The focus ring is equipped with a Manual Focus Clutch that allows you to quickly switch back and forth between manual and autofocus. You can even preset a focus position using the easy-to-read distance meter and instantly return to that position from AF Mode by simply pulling the ring towards you.